We've covered the basics of setting up your Amazon Fire OS development environment for Cordova, so for this post, I'm going to create a new web app from scratch, covering all the varied little details you'll need to know to get your app from idea to Appstore. To do this, I created a simple drawing app that shows off both mobile and platform specific capabilities, and used Cordova to wrap it up into a native app ready for publication. For the sake of simplicity, I developed an app targeting just Amazon devices. Though much of the power of Cordova is the fact that it allows developers to create cross platform apps, it can also be used as a way of quickly creating apps targeted at a single specific platform. This lets me use some more advanced HTML5 capabilities available on the Fire OS platform - in this case the accelerated 2D drawing canvas - and it also lets me cut some corners and use my rusty Java skills to add a few lines of native code to enable some needed functionality. In the future, I'll take this bit of native code and turn it into a plugin that can be used to target a wider range of devices. 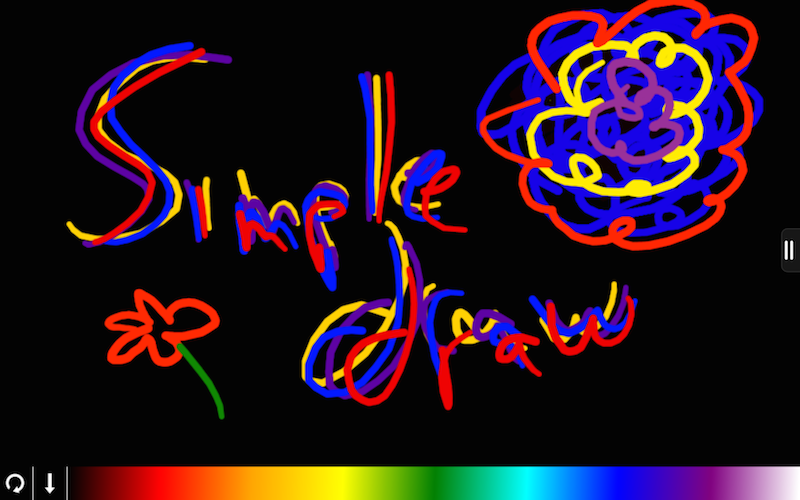 I called the app Simple Draw, and it's available on the Amazon Appstore right now, downloadable for free. If you have a Kindle Fire device, go grab the app and try it out. It's a very simple drawing app targeted at young children - you can draw with your finger in various neon colors, clear the screen, or save the drawing as an image, which you can view in your Photos and share with others. Here's everything you'd need to do to create this app yourself. This will create our new Cordova project directory, pre-fill it with the skeleton folders, and then add in the appropriate Fire OS support files (amazon-fireos). (The first time you run through this process, you'll be prompted to download the AWV SDK found here) Make sure you change the package name to be unique to you or your company, rather than com.example.html5 in the above example. The resulting directory should look like the following - I expanded a couple important folders to show where we're going to be tinkering. Let's take a quick look at both files. For the menu, I used an image program to create some basic icons, which I converted into data:// URLs. 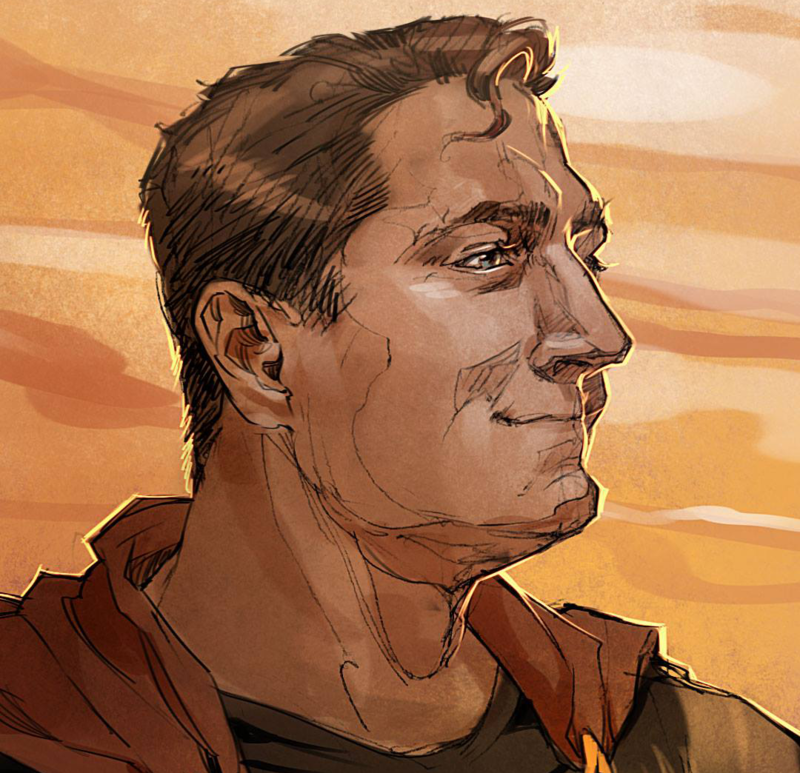 This makes the script a bit more contained. Images still take time to load even from a data URL, so I added onload listeners to draw the icons to the canvas. Rather than draw to the canvas every time the event fired, I call the drawLine() function using requestAnimationFrame. This makes sure the screen is ready to be redrawn, and makes the app a bit more performant. Since modern desktop browsers enable touch-event emulation, I didn't bother adding in mouse events as I'm targeting only mobile devices. 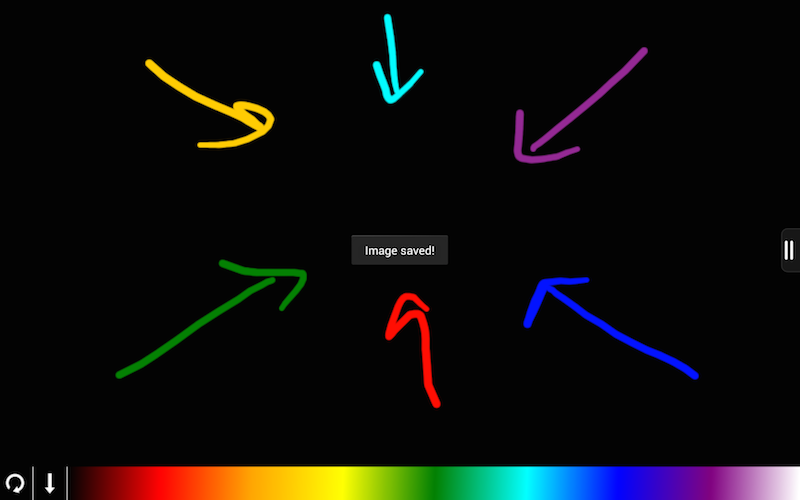 The saveImage() function has a reference to a SimpleDraw object. This doesn't exist in the web engine until we add it using the Java wrapper (below). So we're all set with the main functionality of the app, and can quickly test the script by building/running the application on the device. Please note: Cordova apps for Fire OS don't currently support emulation because of the integrated nature of Amazon WebView. On first run, this will compile the application using the Android Developer Toolkit, then push the app's debug version to your Kindle Fire so you can test. Hey, it works! Well, almost - it doesn't actually save the images, so we'll have to wire that up next. When I first started testing out the functionality of the app, I assumed I'd be able to use the Cordova FileSystem API plugin to save the resulting image to the local file system. So I added the plugin via the command line (see the Cordova docs on how to do this), and used it to save the canvas image data as files. But I couldn't see them from the Photo gallery! That's not useful for this particular application - so I uninstalled that plugin, and decided to add that bit of native functionality myself. Rather than using the basic File API, I used the built-in MediaStore class to save the converted PNG image to the file system, which automatically updates the device's internal data table so it appears instantly in the Photo gallery. In order for the app to be able to save files to the device's local storage, it needs to have the right permissions. 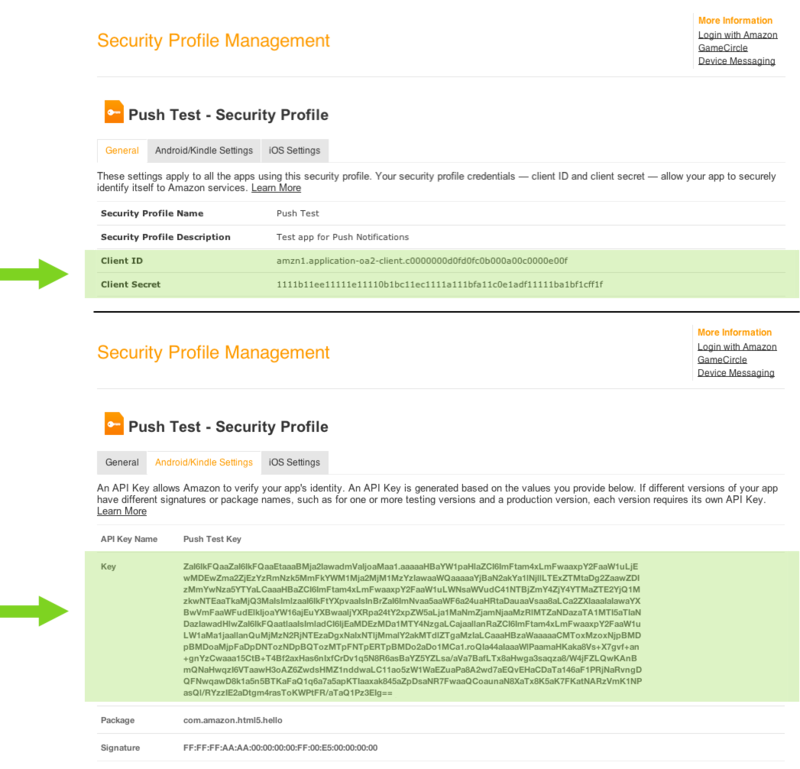 This is done by editing the AndroidManifest.xml file found in the /platforms/amazon-fireos directory. In the example below, you can see that the WRITE_EXTERNAL_STORAGE permission has been added to the list of user-permissions, allowing the app to save images to the file system. Additionally, the android:screenOrientation flag has been set in the application element to lock the screen to landscape mode only. Now when you test out the app and click the download arrow, the image will be saved and you'll get a native Toast message pop up confirming the process. If you check in the Photos app, you'll be able to see your image. Hooray! So the app now works, but we're still a few steps away from publishing it to the Amazon Appstore. 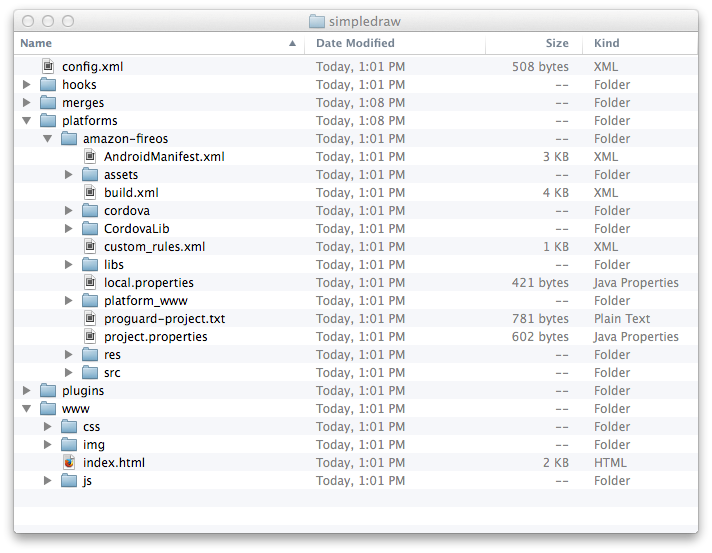 The Cordova config.xml settings file can be found in your main project folder. Enter in your contact details, the name and description of your app, and then add in Fullscreen and BackgroundColor preference tags (see below) which will make your app fill the entire screen, and prevent any sort of color flash as it loads. Now when you build and run your project, the generic Cordova icon will be replaced by your app's custom icon. We're almost there! One last step before we're ready to publish the app is to create a signed -release version of the app's .apk file. Up until now, the Cordova build process has created -debug versions of the app for testing, but now we'll set up the files needed to sign the apk when the --release flag is passed to the build command. This will prompt you for all the information you need to enter and create a new keystore file for you to use to self-sign your app. Put the keystore somewhere safe and accessible from your Cordova project, and don't forget the password! This time it will go through the normal build cycle, and then stop to ask you for your password to your keystore and alias. Once it is complete, there will be a brand new signed apk ending in -release.apk saved in the platform's ant-build directory. For example /platforms/amazon-fireos/ant-build/SimpleDraw-release.apk . Now that you have your apk ready to go, you can submit it to the Amazon Appstore! You'll need to gather some screenshots, that big icon image from earlier, and fill out some details describing your app on the site, but within a short time the submission process will be complete. To start the process, head to the Amazon Developer Portal and click on the "Submit Android App" button (you'll need an Amazon developer account of course – that’s free). That will guide you through the process - for more information about the type of information you need to answer, definitely check out our helpful submission documentation as well. Hopefully this will save you some time when developing your own Cordova app for Amazon Fire OS. Though it may seem like a lot of steps the first time through, it's really only a few extra files that need to be created or changed, and the end result is a fun new app created using familiar, yet powerful, web technologies. Good luck with your app - and definitely contact us if you have any questions or concerns!